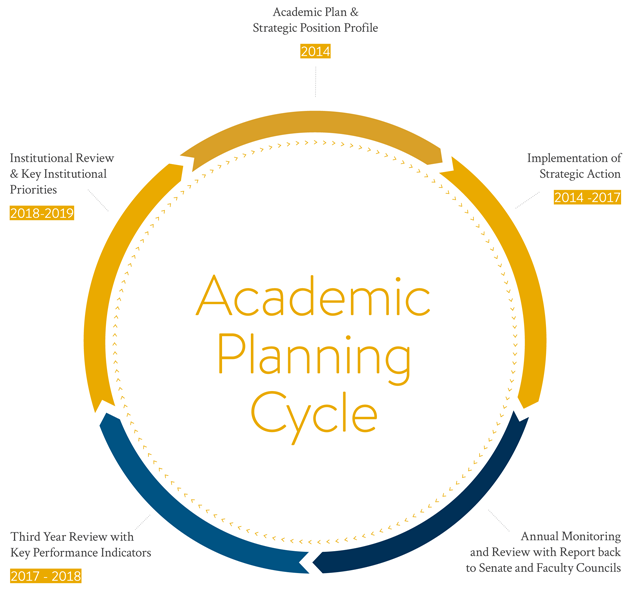 The current academic planning process was initiated in January 2014, following approval of an integrated academic planning framework by the University Senate. The steering committee structure and membership were established and approved by Senate in February 2014. The steering committee consisted of 19 representatives from across the University community and community at large. The self-assessment, institutional review, and environmental scan activities were conducted through a comprehensive review of institutional data, a literature review of evolving trends in post-secondary education and approaches to academic planning, and data collection and analysis. Data were collected by (a) the hosting of eight town-hall or consultation meetings with a variety of internal and external stakeholder groups (Faculties of Arts, Education, Health Studies, and Science and the School of Music as well as with the Academic Service Units such as Brandon community and students, Indigenous Peoples’ Centre and Aboriginal community, and Student Services and the Library), and (b) an online institutional survey distributed to students, faculty, alumni, board members, and external stakeholders with 417 respondents. Institutional priorities and strategic actions emerged from the analysis of current trends and stakeholder input collected. The Integrated Academic Plan aims to establish an understanding and consensus across the University community around the key priorities that Brandon University will pursue over the next five years to fulfil its mission and vision, uphold its values, and meet the needs of the individuals and communities we serve. The key priorities are contextualized across a setting that recognizes the current position and the future desired state of the University as well as forces influencing post-secondary education as a whole. The Integrated Academic Plan is a part of a recursive process envisaged to support continuous progress towards the achievement of the mission of Brandon University.